RoK firms inquire into business opportunities in Can Tho (25/04/2019-16:00:00 PM) A business delegation from the Republic of Korea (RoK) led by Lee Dae-jik, director of the agriculture and maritime affairs bureau of Gyeonggi province and director of the Pyeongtaek port company, had a working session on April 23 with officials of the Mekong Delta city of Can Tho on cooperation possibilities in port and logistics services. 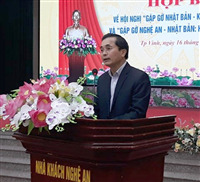 Binh Duong, Dong Nai expect higher growth in wood exports with CPTPP (23/04/2019-15:23:00 PM) The southern provinces of Binh Duong and Dong Nai, which have the highest export growth rate and number of businesses in the wooden products sector, are poised to take advantage of the benefits of the Comprehensive and Progressive Agreement for Trans-Pacific Partnership (CPTPP). Hanoi vows to facilitate construction of Samsung R&D centre (23/04/2019-15:18:00 PM) Hanoi will create optimal conditions for the licensing and construction of a new research and development (R&D) centre of Samsung Vietnam, Chairman of the municipal People’s Committee Nguyen Duc Chung has said. Dong Nai seeks US$ 1.2 bln of investment (23/04/2019-15:16:00 PM) The southern province of Dong Nai invited investors to pour investment in six transport infrastructure development projects worth US$ 410 billion and six others valuing US$ 806 million on sewage treatment. Nghe An works to enhance ties with Japanese partners (19/04/2019-14:26:00 PM) The central province of Nghe An is taking measures to enhance its cooperation with Japanese partners, with focus on hi-tech and supporting industries, manufacturing, hi-tech agriculture, and cattle-feed production.